March 15, 2002, was a landmark day for biodiesel. Seventeen years ago, Minnesota enacted the nation’s first biodiesel mandate, which went into effect in 2005. Today, 20 percent biodiesel is required in all No. 2 diesel sold April through September. IKEA Transport & Logistics Services, CMA CGM, the GoodShipping Program and the Port of Rotterdam are cooperating in a first-of-its-kind partnership to test and scale the use of sustainable marine biofuel oil. Bunkering will take place March 19. 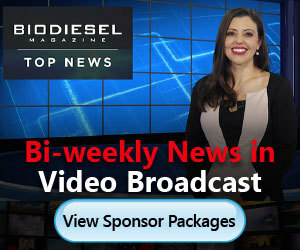 Biodiesel imports to Germany rose sharply in 2018 triggered by overabundant supply from Argentina. UFOP fears that a similar development will take place after the EU Commission’s ongoing antisubsidy proceedings against Indonesia have been concluded. U.S. EPA retroactively granted five new small refinery exemptions for 2017, releasing them from their obligations under the RFS. The five new small refinery exemptions reduced the 2017 RVO for biomass-based diesel by an additional 48 million gallons. The Minnesota Soybean Research & Promotion Council plans to co-locate its new Soy Innovation Campus with Epitome Energy LLC’s proposed 30 MMgy biodiesel production and soybean crush facility in Northwest Minnesota, in the town of Crookston. On March 12, Washington—the Evergreen State—showed its true colors when the House of Representatives passed a bill designed to reduce transportation GHG emissions 10 percent below 2017 levels by 2028 and 20 percent below those same levels by 2035. The U.S. EPA released its proposed rule March 12 for year-round E15 sales and reforms to the RIN market. Much of EPA’s proposed RIN market reforms apply only to D6 ethanol RINs, although EPA is accepting comments on this narrow applicability. Biodiesel producer Renewable Energy Group held an open house March 1 in Seneca, Illinois, to celebrate the start of construction on the company’s first diesel fueling station. REG owns and operates a 60 MMgy biodiesel plant in Seneca. National Biodiesel Day takes place March 18, in honor of Rudolf Diesel’s birthday. This year, the National Biodiesel Board celebrates a few of the many biodiesel champions who helped make this industry the success it is today. California biodiesel producers, blenders and industry stakeholders sent House leaders a letter March 6 urging them to renew the biodiesel tax credit. The House ways and means committee will hold a hearing March 12 related to temporary tax provisions.